Omega and prestige go hand-in-hand. The Swiss watchmaker was founded in 1848 by Louis Brandt; since then, Omega watches are amongst the most admired in the world, renowned for their innovation, cutting-edge technology and sophistication. The new Omega Seamaster Diver 300m pieces are in keeping with the brand’s reputation for excellence. A new addition to the line, the watches have undergone a makeover but still reflect the original design and ocean spirit of the collection. We’re proud to stock first-class Omega timepieces at Banks Lyon, including the new Seamaster Diver 300m range, which is already a favourite among many watch admirers around the world, including celebrities. For over 170 years, Omega have commemorated the Earth’s history with timepieces that have served on NASA’s lunar missions, conquered the oceans and adorned the wrists of global leaders and explorers, such as Jacques-Yves Cousteau. Famous Omega wearers include Buzz Aldrin, George Clooney and Elvis. The brand has also been a favourite of one of the most popular fictional characters of all time, James Bond; the British spy has worn Omega timepieces in movies since 1995, when GoldenEye premiered. 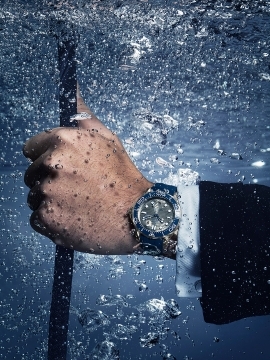 Omega’s focus on precision has allowed them to be the official timekeeper of the Olympic games. They have also created the first tourbillon wristwatch calibre in the world and introduced the first mass-produced timepiece with coaxial escapement – this is considered one of the most important advances in horology. Omega is responsible for the creation of the first watch on the moon in 1969, as well as the creation of the first ever movement resistant to magnetic fields over 15,000 Gauss, which was accomplished by using non-ferrous materials; a similar movement was worn by Daniel Craig as James Bond. The brand’s drive to constantly innovate has allowed it to stand out from other global watchmakers. The Seamaster Diver 300m has been a favourite of many film and watch enthusiasts since 1993. With the collection celebrating 25 years, there could be no better time for Omega to update it with more advanced materials and technology. With a 42mm ceramic bezel with the diving scale in CeragoldTM or white enamel (which is long-lasting and durable), the timepieces honour the soul of the original collection while taking it to an even higher level of precision, design and performance. There are 14 new models in the line, six in stainless steel and eight in a mix of stainless steel and gold. Each piece has an integrated black or blue rubber strap or a metal bracelet with a new ergonomic design created for comfort. The new helium escape valve is now conical and comes with a patented technology that allows it to be used underwater. The ceramic dials are available in black, blue or PVD chrome, and the famous wave pattern has been reinstated in the new pieces, though they’re now laser-engraved. The indexing has been filled with Super-LumiNova, allowing divers better visibility underwater. Wearers can see the METAS-approved Master Chronometer Calibre 8800 through the skeleton caseback. Legendary and with a heritage rooted in adventure, the Seamaster Diver 300m collection has now been instilled with new blood that pays homage to Omega’s maritime legacy. The sophisticated Omega Seamaster Diver 300m Chronometer 42mm watch, which you can find at Banks Lyon, is the perfect example of a piece that flawlessly blends advanced technology, striking design and high accuracy. Driven by a self-winding automatic movement with co-axial escapement, this C.O.S.C.-certified model is truly a watchmaking icon. Crafted with optimum performance in mind, the watch is water-resistant up to 300 metres, perfect for divers – as well as gents with a passion for the outdoors – who are looking for a stylish, yet functional piece they can rely on. The beautiful blue dial has round hour markers, skeleton hands that have been re-designed and a date window at 6 o’clock. This Seamaster Diver 300m model is also incredibly durable with a scratch-resistant sapphire crystal and stainless-steel case. This watch is ideal for aficionados who are looking for the perfect combination of technological innovation, high performance, stunning design and heritage. The James Bond actor has been a watch enthusiast since childhood. His fascination stems from the fact that they’re collectable, as well as from the world-class precision and technology required to create them. 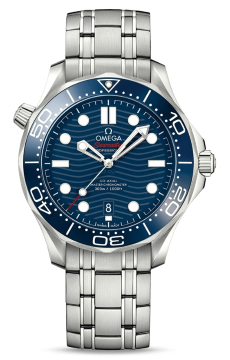 Daniel Craig is now the ambassador for the legendary 300 models and, even though he’s always been a fan of diver watches, he only really gained a deeper understanding of Omega through the famous spy. Omega and James Bond are a perfect match, as both are fashion icons and appreciated for their adventurous spirit and reliability. At Banks Lyon, we have a long-standing passion for the Swiss brand. We’ve been official stockists for years and our Lancaster store manager, Myles Harrison, has recently become an Omega Grand Ambassador, an exclusive title that only a few have the honour of receiving. Let us help you find the perfect timepiece for you, be it a Seamaster, a Planet Ocean, an Aqua Terra or any other in our vast selection of Omega watches. Visit us in Lancaster or Kendal and see the fantastic new additions to the renowned Seamaster Diver 300m collection in person.